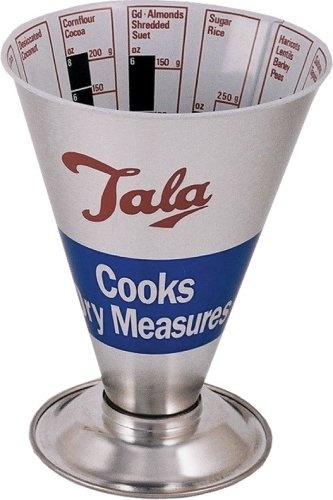 This versatile measuring tool is popular with both professional and domestic cooks and is quicker than using kitchen scales. Simply pour ingredients up to the desired level for speed and accuracy without using weighing scales. The cook's measure is calibrated in both metric and imperial so it is easy to follow favourite old cookery books as well as recipes passed down from a mother or grandmother. The cook's measure is also calibrated for fluid measurements and can be used to measure liquids for immediate use but it is not watertight and liquids will soon find their way through the seams. You can also measure: rolled oats and bread crumbs, coconut, cornflower, cocoa, almonds, suet, sugar, rice, lentils, barley, sultanas, semolina, raisins, icing sugar and more.